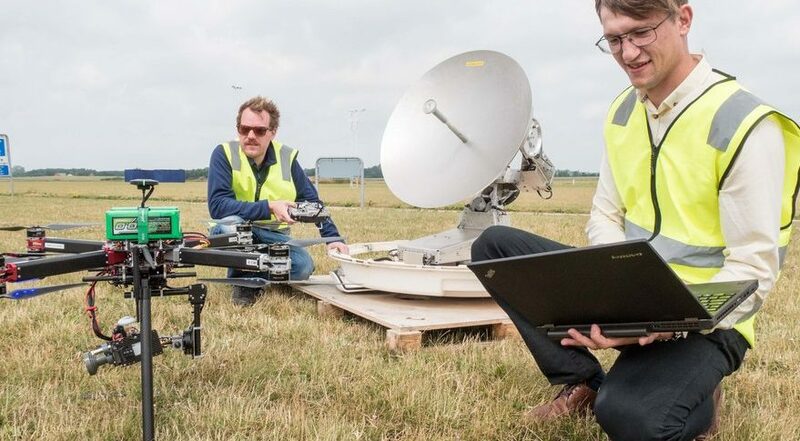 SAN FRANCISCO – QuadSat, a Danish company focused on testing and calibrating satellite antennas with quadcopters drones, plans to recruit satellite engineers with 700,000 euros ($796,000) raised in a seed investment round announced Jan. 16 led by a Danish investment fund and with support from Seraphim Capital. Founded in 2017 in Horsens, Denmark, QuadSat opened an office at the Harwell Space Cluster, after participating last year in Seraphim Space Camp, a nine-week accelerator program for space technology startups. Satellite communications antennas undergo extensive testing in factories, dedicated test facilities and in the field to prove they can establish and maintain communications without interfering with adjacent satellites. Often, ships and aircraft are taken out of service during these tests. QuadSat plans to offer ship and aircraft operators an alternative: testing and calibrating antennas on-site with drones, which is “much more cost-effective and less time-consuming than current methods,” Espeland said. Satellite interference is on the rise, a problem Espeland correlates with the widespread adoption of communications on the move. In the next year, QuadSat plans to gain expertise and conduct customer trials as it focuses on another challenge: helping manufacturers win initial approval for satellite antennas, Espeland said.